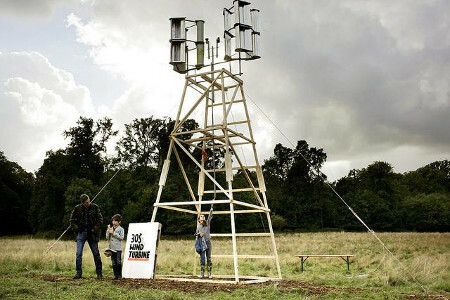 The wind turbine can be built entirely from reclaimed material and standard parts to provide free, clean, renewable energy in windy areas. The turbine’s vanes are built from panels cut out of discarded aluminium offset printing plates. The vanes are mounted on a reclaimed bicycle wheel, which provides a sturdy rotational axis. The three-vane version has been successfully survival tested against 80 km/h sustained winds, the six vane version works even with 105 km/h.